Seventeen days until Thanksgiving. Making a bullet point list of things to get done, by day. Making a shopping list. 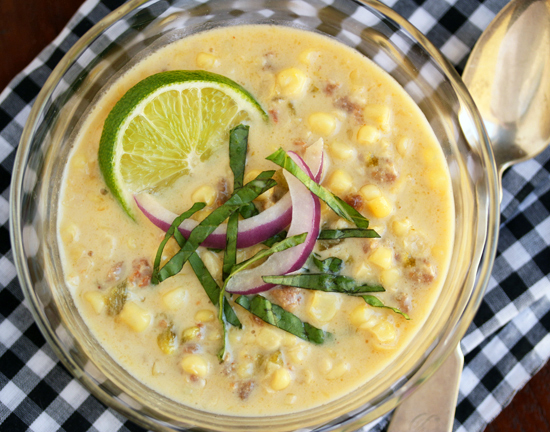 Making some dishes ahead of time and freezing, like this Spicy Corn Bisque with Chorizo, Poblano & Lime. When I saw this recipe in the July 2013 issue of Sunset Magazine, I knew this was the one. After I made it, served it at a friend’s birthday luncheon, and made it a second time for myself, I was positive it was on the holiday menu. Every ingredient in this recipe is just screaming my name. The original recipe called for poblano chiles, but my market didn’t have them, so I went with the Anaheims. They are blackened under the broiler, then peeled, seeded and chopped, adding a great charred note to the soup and their green chile spiciness. Oh yes. As I said, I made this recipe twice, and a little differently each time. The first time I used corn on the cob that was very pale yellow, almost white, but was really sweet and juicy. I was in a big hurry to try making it, only to find I didn’t have the entire amount of chorizo called for in my freezer. I only had about 6 ounces, but I cooked up the soup anyway. I also skimmed off the reddish orange chorizo fat, thinking about calories. As you can see in the photo above, I got a beautiful pale yellow soup that was oh so tasty. It was so good, that I had to make it again, this time with the full amount of chorizo. Mulay’s Chorizo, of course. So off I went to Whole Foods to see if they had any. Lo and behold, there were about 8 beautiful packages in the cold display. Horray! 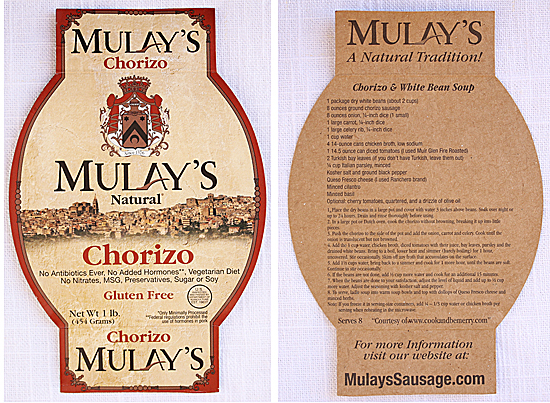 I love Mulay’s Chorizo, and no, they’re not paying me to say so. I have used it in several recipes: Huevos Rancheros; Bacon Wrapped Dates Stuffed with Chorizo & Goat Cheese; and Chorizo White Bean Soup. You really need to get some of this stuff! The second time I made the recipe, I bought corn on the cob that was a darker yellow so it would look better in the photos. I also didn’t skim off the orangy red chorizo fat, wherein resides the spicy paprika and other spice flavors. I wanted to taste the full force of those volatile oils. Whoa, Baby! You can see the difference in the colors in the photos. My advice, leave in the oil. Really. You will only make this once a year, so splurge. It will totally be worth it. 1. Preheat broiler. Line baking sheet with aluminum foil and lightly oil. 2. 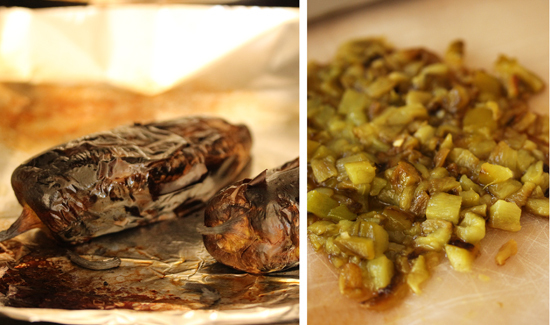 Place chiles on sheet and broil, turning occasionally, until blackened all over. Cool, peel, seed and cut into 3/8-inch dice. Reserve. 3. In a large Dutch oven, cook chorizo over medium heat, breaking into small pieces with large spoon or stiff spatula, until starting to brown. If you are skimming off fat, do it now. 4. 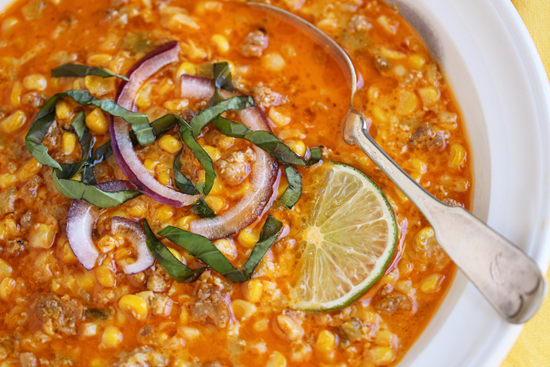 Stir corn and broth into chorizo, bring to a boil and cook for about 5 minutes until corn is no longer raw. 5. Add cream and chiles to pan and heat over medium-low until very hot. Do not boil, which may cause cream to curdle. 6. 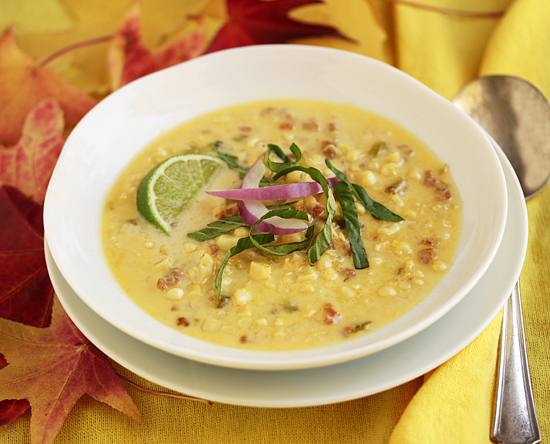 Ladle into warmed flat soup bowls and squeeze 1 lime wedge over each. Garnish with red onion and basil. Serve. OMG! Hahahahaha! They didn’t ask for your permission first? They probably didn’t want to deal with your agent and other handlers. Congrats! 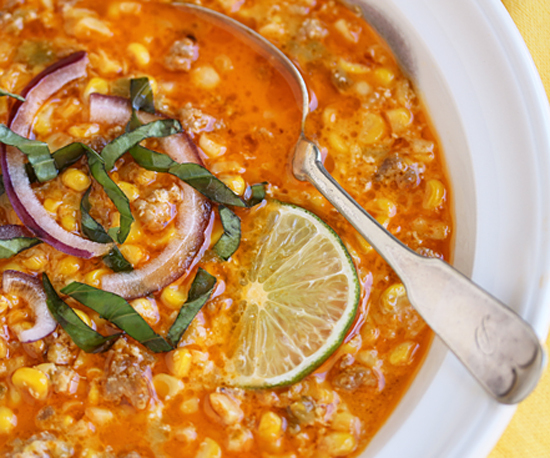 I do something similar, but I love that you add chorizo & lime juice. You are one of the best food photographers…Your photos of the food you cook always make me want to make your recipes! The soup is beautiful, both with and without the fat. I can certainly imagine just how much flavor that fat would add, so I can see the benefit of leaving it, but it looks so beautiful without it – cook’s choice, as they say. This would be so nice at Thanksgiving; with the chorizo it is a twist on the traditional American, yet still entirely in keeping with classic fare. And I bet the lime was the perfect addition. Brava! oh wow. This looks fantastic! I can’t believe I have never tried bisque before!